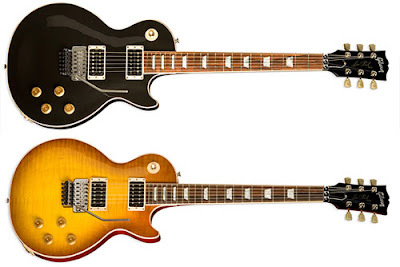 Today I was browsing the Gibson guitars web site checking out all the new models coming out onto the market for 2009. Enter....The Gibson Les Paul Standard Axcess. The major addition to this model of the Les Paul Standard is the Floyd Rose Vibrato. 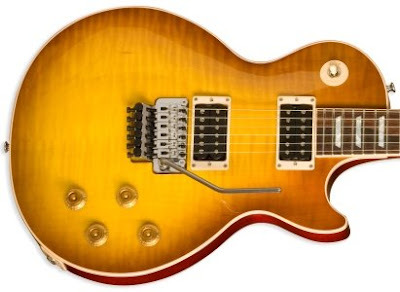 It is nice to finally see the addition of a Floyd Rose on a Les Paul! Gibson is now installing the Floyd Rose right at the factory during the building of the guitars. 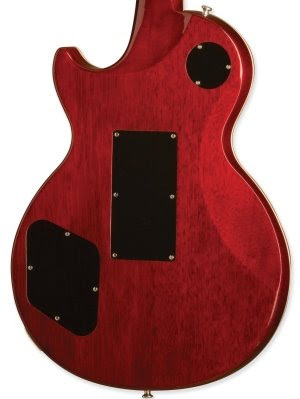 In the past, many musicians have tried to add a Floyd Rose to a Les Paul with mixed results. One of my favourite guitarists is Neal Schon of the band Journey and Neal was one of the first musicians to add a Floyd Rose to Les Paul guitar. Many people thought he was crazy but, he did it anyway. Below are some pictures of the new Les Paul Standard Axcess guitar with Floyd Rose Vibrato installed. For more information about this guitar, click on the web link on the Gibson guitars web site and get all the details. The Les Paul Standard Axcess is available in two finishes, has the Floyd Rose Vibrato installed at the factory making it a perfect setup! Here is a closeup shot of the Axcess body with the Floyd Rose built right into the top of the body and recessed flush with the height of the pickups. Here is a shot of the back of the guitar. Note the absence of a heel joint and steel plate at the nect joint. This guitar has a neck-through-body style joint making it a very smooth body joint. This allows the player full access to the higher registers on the neck. Epiphone another Gibson company has Les Paul guitars available at greatly reduced pricing compared with the Gibson Les Paul models. Last summer my wife Jenn entered a radio contest and she won me a new guitar! It was the Epiphone Les Paul Ultra. This is an excellent guitar!!! Below is a picture of the Epiphone Les Paul Ultra model guitar that now own.